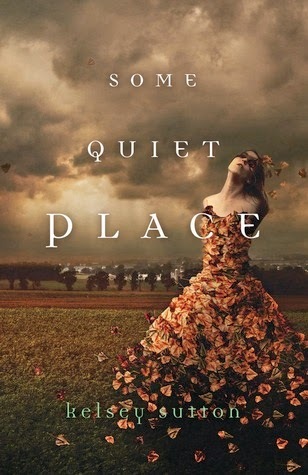 Some Quiet Place follows an emotionless girl in a bad home who is having strange, dark dreams and has no idea why she can see Elements and Emotions as they visit people around the world. Not that she's worried; she isn't capable of worry, or love or anger or fear or anything else. Odd though this premise sounds, I really liked Elizabeth's character, the supernatural elements of her world and the writing. Unfortunately, I wasn't a fan of the direction the story took following the main mystery reveals. Elizabeth. I really, really liked her. I love the way her lack of emotions is approached and the way her manipulation of the people around her is explained. It makes sense and it's relate-able. We all push people's buttons. We all act a certain way or say certain things to elicit certain reactions. The story is strange, different. It felt like something I hadn't read before, and the (somewhat apathetically approached) mystery of why Elizabeth can see and hear these Elements and Emotions is interesting because she knows so little about it. The Elements/Emotions. They are neither good nor bad. They act and are according to their natures and purposes. Fear has no qualms/angst about making people afraid. He may even enjoy it, but that's what he is created to do; that's his purpose in life. Their simple, clear approach to their jobs/existences is refreshing and fun, as are their reactions to emotionless Elizabeth. Fear takes it as a challenge; Anger is ticked he can't affect her, so he ignores her; others smile and wave and say hi or frown and hurry off. The character "development" of the MC in the last fifth of the book. I liked her better before and became much less invested following this change. I wish she had stayed the Elizabeth we knew; she was more interesting and more sympathetic to me. The increased "romance"/feelings toward the end. I preferred the emotionless beginning, not least of all because this "romance" leaned a little too far toward an unnecessary love triangle. As a whole, Elizabeth's relationships with friends, family and boys are much more interesting without emotions because they're a matter of commitment and choice, not hormones or affection. I'm not sure I liked the big baddie they introduce in the last third or so. He makes sense in the overall story, but I liked the everyday conflicts of the first half of the book more than the epic fight between good and evil it became. I loved the beginning of this book, all dark and sinister and AWESOME, and was looking forward to 4 stars. But it devolved into a paranormal romance at the end and completely changed the characters and character dynamics I liked. The story would have been better had emotional romance remained an impossibility. However, if you prefer a romantic payoff, you'll probably be satisfied with the ending and the book as a whole. Based on the reviews I've read...the companion is much more like the end- love triangle, heavy on the romance, etc. I'm still kind of tempted to try it though, since I liked the general concept of the world and the writing. Sounds like a book that doesn't need a sequel (as usual). I wish there were more female protagonists who didn't may attention to emotions. Looks like the "sequel" is actually a companion novel with a completely different set of main characters. We'll see whether it's worth a go. Awww, I really really liked this book! It was one of my favorite books of 2014. I really enjoyed the characters and the romance, but I can totally see what you mean about the "big baddie" in the last third of the book. It was kind of strange, how Sutton introduced the villain of the story, right? But I really enjoyed this book. I'm hoping the companion is going to great. Fabulous review, Kel! I'm glad you loved Some Quiet Place! It really is well written; I just wish I had loved the last third as much as the first two. I know the villain didn't come out of nowhere, but it was definitely a major shift in the story. I'd like to give the companion a shot; time to start dropping purchase requests on the librarian's desk. :) Thanks for the lovely comment!